Huge shout out to the Girls Got Game Leadership Team. 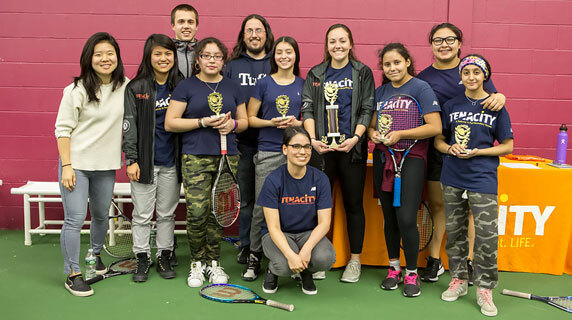 The first ever Girls Got Game tournament, the G3 Championships, was a huge success as girls from all Middle School Academy sites and from several partner high schools came together in a city-wide and Tenacity Pathway-wide competition. The MSTL’s fall season has been one of the most exciting and competitive in recent memory. All teams have competed hard and played well. Here is a rundown of how each team in the league has fared. The Tenacity Middle School Tennis League gets under way in mid-October, and this season promises to have all the drama, intrigue, and multi-faceted story lines that fans throughout the city have come to expect. With another middle school tennis season in the books, many schools' programs are still in session, but are winding down for the end of the school year. The eleventh annual Crane Cup championship was played last week at Harvard’s Murr Center, and all six Tenacity middle schools put on a dazzling performance for all to enjoy. The Staniar Open is Tenacity’s biggest tournament for 6th grade students. It is for Tenacity athletes what a Grand Slam tournament is for professional tennis players: the event that makes all of their training worthwhile. With both the Staniar Open and the Crane Cup tournaments around the corner, many schools are faced with a difficult decision: choosing which players to enter into the events. The Mario Umana Academy has several players vying to represent their school at these tournaments.